It’s tax season, and CPAs across the country are working around the clock, seldom leaving their desks as they endeavor to complete tax return after tax return. Massive quantities of pizza and Chinese takeout are being consumed. Clients are dropping by with donuts. Coffee is brewed by the gallon. Sunshine and time spent outdoors are mere memories. But not in our office! We’re still logging just as many work hours as those other firms, but we’re doing it while getting our steps in. 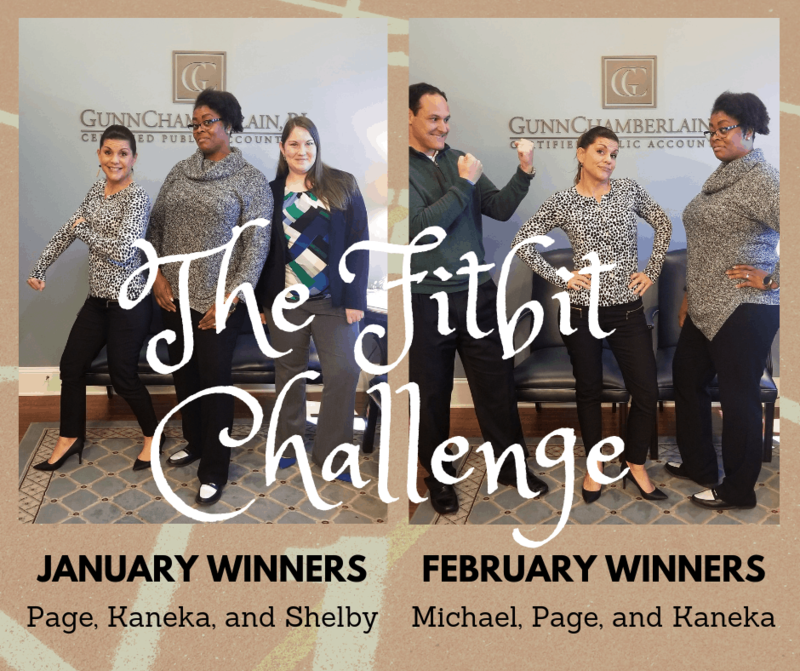 That’s right: the fourth-annual GunnChamberlain Fitbit challenge is on, and every one of us is struggling to take down three-time reigning champion Page DeWitt while raising money for our favorite charities AND filing tax return after tax return. We’re ditching (most of) the donuts and stepping around the office, hitting the trails during lunchtime, and climbing stairs late at night when we get home and need a few extra steps to hit our daily goals/exceed Page’s total. The stakes for hitting our numbers are great. The overall winner, who logs the most steps from January to April 15th, gets a $100 gift card and a $1,000 donation to the charity of his or her choice, plus a year’s worth of bragging rights. Second place gets a $50 gift card and a $500 donation, and third place gets a $25 gift card and a $250 donation. Past beneficiaries of the challenge have included K9s for Warriors, The Promise Radio, and Pet Rescue North. This year, the contenders are already thinking about who they’ll give their winnings to—The Salvation Army, St. Jude’s, The Wounded Warrior Project, and The Humane Society are all in the running. There are also prizes for the top steppers each month. In January, the top three were Shelby, Page, and Kaneka. February’s rankings changed a bit, with Page, Michael, and Kaneka pulling into the lead. We’ve unofficially dubbed this the Beat Page Challenge. If you see Page, try to convince her to sit down. One of our favorite parts of the challenge is seeing our coworkers make healthier choices overall. The push to move more leads to better diet choices and long-term exercise plans. As we close in on the end of tax season, the Fitbit challenge is heating up. Who will take home the glory and earn a gift for charity? Come back in April to find out.